Congratulations, both for actually walking the Way, and for being astute enough to know how important it is to walk the Way, and what an achievement! I came upon El Camino far too late in life to walk it (although I suspect there are oldies and wrinklies who’ve done it anyway). But we traversed it with a small group, stopping from time to time to walk at least a few paces, and hearing stories about it as we went. One of the peak experiences in my life! We saw The Way after we did the walk as we didn’t want spoilers or any preconceptions before we went. The Camino is a life-changing, magical and uplifting experience! It’s one of the most memorable things we have done! Truly an amazing achievement! Congratulations on this accomplishment. 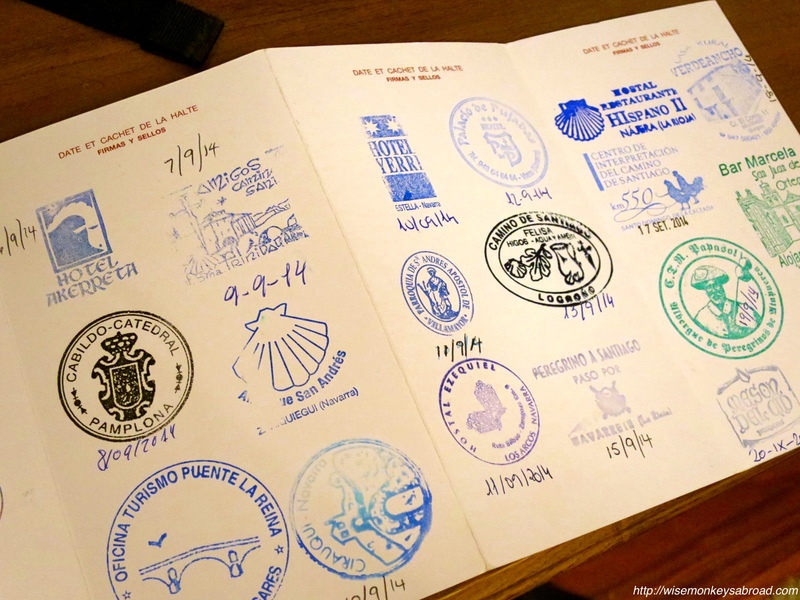 Perhaps you can frame your stamped Camino passport. Yes, do look more into it. To put it simply, the Camino is a ‘pilgrimage’ to Santiago de Compostela (where it is said to house the remains of St James). People can pretty much start anywhere but the most famous and popular is the Camino Frances which starts in the south of France (St Jean Pied de Port) and crosses into Spain. It wasn’t easy but it was worth every second! Definitely second the idea to frame this accomplishment! Thanks Ayla!! You are so sweet in saying that 🙂 we are having these passports and our certificates framed. We can’t wait to get it up on our wall! Yes, I went to Turkey and Egypt while you were traveling 😀 Amazing!!! Lucky you 🙂 Turkey is incredible, huh? And Egypt is somewhere we have dreamed about going for ages but just have never got there. Yess, indeed, I loved Turkey!! I must say I was impressed, especially with the people, so nice! wow! super cool achievement!! well done & congrats to both of you! Thanks Indah 🙂 It was a truly rewarding and uplifting experience for us both!! Totally… who doesn’t love collecting stamps, right? 🙂 Hope you have been well! Actually, that reminds us we need to visit your blog and do some catching up! That’s great! What an accomplishment. I’d not even heard about this before I read it here, but it’s on the bucket list now for sure! It is an absolutely wonderful experience that we are so grateful to have been able to do 🙂 Hope you have the opportunity one of these days too! Ha! That’s a good question 🙂 We have been thinking about it and yet to come up with the right answer. Hope you have been well! Yes. We’ve been buried in the “next country” shenanigans. Don’t know if you caught the post, but its Jamaica next summer! No, we must’ve missed that post – feels like we have plenty of catch up to do! So Jamaica next summer?? NIIIIIIIICE!!!!! That really is an achievement to be proud of. Thank you 🙂 We are waiting for our certificates & these very passports to be framed. They are with the framers right now… can’t wait to get it back and mount it! wow.. the passport!! This is some achievement indeed!! Thank you – will be sure to check yours out! Once again, congrats on walking the Camino, Monkeys! You got a nice souvenir there as a reminder of all the hard work that went into it 🙂 I suppose when you look at each stamp now you are reminded of something memorable on each leg of the journey. Looking closely, I can even see a stamp that has two chickens on it. Now that must have been a fun leg…I think 😉 Hope you two are having a good weekend! Mabel, we wish you a wonderful weekend also! Happy Sunday! Oh thank you so much! We hope you get to do it one day soon. It is just an incredible experience. Awesome! 🙂 You have a great weekend also! Neat! I treasure mine too . My stamps are much more higgledepiggledy than yours and each one brings so many memories. Sigh.